Recently I was tasked with developing an Apple Watch extension for an existing iOS app. Since I have no interest in Apple Watch, I’d never taken the time to use one, or investigate the development process. After about a month of banging my head against the keyboard (in a metaphorical sense), I thought I would complain about my experience on the intarnets. First of all, Xcode won’t install development builds if the watch is locked, and the watch locks itself on sleep when not being worn. So you basically have to be wear it in order to do any sort of active development. Annoying if wearing something on your wrist is irritating whilst typing. Speaking of wearing the watch: the plastic band which is included with the cheapest watch is the absolute worst. To secure the clasp, you need to thread the loose end of the strap in such a way that the rubbery exterior rubs right against your wrist, catching and pulling out every arm hair in its path. When testing a watch app on the actual device, the app never launches automatically. Xcode says it is running, but there’s no indication on the watch itself. My technique here is to open an unreleated app, which seems to trigger something and remind the watch that it’s supposed to be running the development target. The watch simulator is no better. Apple Watch has two modes of interaction: touch and “Force Touch.” The simulator’s default option is to differentiate between the two by using Apple’s new pressure-sensitive trackpads (if available). Problem is, it doesn’t work. Then you need to switch input modes by using a keyboard shortcut. Except the shortcut doesn’t always work either. When trying to bring up a context menu, I’ll Cmd+Shift+2 to trigger a “deep press,” then tap the simulator, and nothing happens. It seems to randomly work on the 3rd or 4th try. Communication between the watch and phone is slow and/or buggy. Even on the simulator! I guess maybe they’re trying to totally emulate real-world behavior, which in that case kudos all around. I will randomly get WCErrorCodeMessageReplyTimedOut errors, then do the exact same thing a second later and have it work flawlessly. Speaking of communication, you’ll probably want/need to communicate with the parent iOS app from a number of the different views in your watch app. Problem here is that only one WatchKit class can receive messages from the phone. So you end up making your extension delegate the message-sending delegate as well, and handle communication within the watch app by sending notifications everywhere. For a simple app it might not be so bad, but that sort of architecture gets unwieldy rather quickly. Maybe I’m just a dummy, but Apple’s documentation sure doesn’t mention any other potential design patterns. Speaking of documentation, Apple’s documentation is… not great. Many times there was no differentiation between watchOS 2 and watchOS 3 APIs. I spent a ton of time finding out that it is impossible to share UserDefaults between watch and phone. Problem is, it used to be possible, and so I fiddled about implementing “solutions” that never worked. I ran into two issues that the documentation makes no mention about. I don’t often ask questions on Stack Overflow, but did for these particular problems. The answers I got were underwhelming, to say the least. Basically, the entire process was death-by-one-thousand-cuts frustrating. I wasn’t bullish on the entire concept of smartwatches, and if this is what the “best” has to offer, I might be put off it for good. Recently I had need of a way to find how “similar” a collection of images were. A classic way to diff images is to take one, invert it’s colors, then draw it over the second at 50% opacity. It’s pretty easy to do this in CSS. If both images are the same, the resulting combination will be perfectly grey (rgb(128, 128, 128)). The only real annoying bit is synchronizing loading each image, and also determining how long the entire diff process took. To that end, I created a giant array of promises, each of which was itself a promise for loading/comparing two images. The resolution of the giant promise array concludes with a timestamp comparision. Where sources is an array of image URLs, and results is an array of integers, indicating similarity between two images in the source array. A value close to zero indicates the two images are very similar, while a value closer to 128 shows that they are very different. I was reminiscing to a co-worker about my time in Japan, and told him a story that I’m not sure I’ve ever told anyone else. So, why not regale the internet with pointless personal anecdotes? For those who don’t know, I taught ESL in Japan from the summer of 2004-2005. Somehow I had ended up connecting with the owner of a private school that was located in Utsunomiya. Definitely something of a backwater locale, even though it’s only 60 miles away from Tokyo. Most of my teaching was in the main office that was close to the center of the city, but I also had to regularly commute to a satellite office that was in nearby Tochigi (bizarrely, on a rail line operated by a department store). The school I worked for, being a small family-run business, had all ages of students: I sometimes “taught” preschool kids, and my oldest student was a guy in his 80s (whenever he missed a class I worried that he had died). One of my students at this satellite office was a junior high student named Moe (pronounced moh-ay). She was actually one of my better students; since she was more fluent in English, our lessons were more high-level, and therefore less boring for me. Towards the end of the 2005 school year, my Japanese co-worker and I had finished a lesson with Moe, when she invited us both to a concert that her school band was giving. While my co-worker demurred, I thought, “Why not?” and told her I’d go (toward the end of my year-long contract, I’d determined that I was not going to stay in Japan, so attempted to have a “try anything” attitude during my remaining time). The concert was on a Sunday, and the day before I was working in the Tochigi office as usual (yes, I had to work on Saturdays, and got Sunday/Monday off). Imagine my bemusement/concern when, at the end of the day, my co-worker suddenly pulls out a giant bouquet of flowers. “Here, you can give these to Moe.” she blathered. I worried about what people might think of a 20-something foreigner giving flowers to a young female student, but felt obligated at the same time. Cursing her under my breath, I took the bouquet, trying not to think about what I was going to do with it. The next day, for the first time ever, I took the train to Tochigi for non-work-related purposes, and walked to the school. It felt pretty weird to be commuting on my day off. I ended up stuffing those damn flowers into my backpack, and figured I’d worry about them later. As I walked into the school auditorium’s foyer, I could almost hear people’s necks snapping as they turned to look at me. Of course, I was the only non-Japanese person there. And I don’t know why I didn’t think of it before, but of course it was an all girls school. The awkwardness of my presence had just increased exponentially. I brazened it out and found an inconspicuous seat near the back. From what I remember, the concert itself was actually enjoyable. I didn’t go in expecting too much (remembering my own school-age band concerts), but as you might imagine, the Japanese always seem to take things to the next level. Not only was the music played impeccably, they also threw in some choreographed movement with their instruments. After the thing ended, the students dispersed into the audience to receive congratulations from their various family members, and I had to deliver that albatross-like bouquet. Fortunately, I was able to hand it over pretty inconspicuously, thanks to the crowd. After the meet ‘n greet, the students were called back up to the stage for a group photo. Imagine my chagrin when the photographer, seeing a white guy hanging around, yelled, “Who’s he with?” When it became known that I was Moe’s English teacher, he told me to get up on the stage for a photo, a suggestion that was enthusiastically received by the girls themselves. “Jeez, you’re tall!” I remember one remarking. So, somewhere in Tochigi, there’s a photo of an all-girls junior high jazz band with a nerdy guy standing in the middle of the group, trying desperately not to look as awkward as he feels. Good times 😅. I seem to continually have dalliances with the Android world. Last year I bought (then sold) a Sony Xperia Z3, then later purchased/returned an LG Nexus 5X. I always seem to end up going back to my trusty iPhone 5, though. There are just enough dealbreakers with any Android phone that make them tough to live with as a daily driver. The thing that I love the best about the Z3 Compact is its screen-to-body ratio. The whole device is just slightly larger than my iPhone 5, but the screen is about 33% larger. Watching videos and reading books is much more enjoyable. Plus, since the overall phone size is manageable, you can use it without resorting to the “smartphone claw grip of death.” The body of the phone looks pretty classy as well – I got the black version, which is like the prototypical black slab that all other smartphones descend from. Unfortunately, Sony never evolved its industrial design past the iPhone 4 era: the phone is all glass, save for the plastic sides. I always treated it fairly gingerly, as I was never sure how hard I could set it down without cracking the back. Unfortunately, the software front is where most Android phones fall down for me. While most of Google’s software is on point (Chrome, Gmail), the Android messaging scene is pretty fragmented. What I want is a Google-endorsed messenger that piggybacks on top of SMS, similar to Apple’s iMessage. The app that might have fit that category (Hangouts) is deprecated, and users are advised to use a standalone SMS app. Rather than double down on Hangouts, Google instead is promoting two new messengers, Allo and Duo, that you’ll have to get all your friends to download in order for them to be useful at all. Blah. At that point I’d rather use Facebook Messenger, which at least most people have installed. Sony also tries to include a lot of “value-added” software, which is mostly worthless. They have all sorts of extra media apps, but without a compelling syncing solution for my Mac, I didn’t load any music or videos onto the phone’s internal storage. A few bloatware-type apps (AR Fun, wtf) were immediately disabled (can’t delete these apps, of course). I could sign up for a “My Xperia” accout, but it’s not immediately apparent what benefit it would give me, aside from yet another set of account details to remember (cursory internet research tells me it’s similar to Apple’s Find My iPhone). Dispite these annoyances, the phone was a pleasure to use, once I disabled/ uninstalled offending Sony software. Since I mostly rely on very basic smartphone apps (Maps, Email, Browser, Books), I don’t mind missing out on the hottest new iOS microtransaction bandit, errrr, game. However, I ended up getting rid of the phone. Since my wife has an iPhone, the lack of iMessage is a real killer. She’d try to send me a video of the kids, and it would be sent as a hyper-compressed MMS. Static images would fare no better. Rather a minor thing, but messaging is the core of my smartphone use. The other unfortunate thing is that the Z3 Compact has no upgrade path. It shipped with Android 4.4, and has been (slowly) upgraded through Android 6, but it’s anyone’s guess how much longer it will receive updates. While my iPhone 5 is nearing the end of its update life (4 years! ), I know that I can buy a new phone with updated internals in the exact same form factor, and have it be supported for another 3+ years. The Z3 Compact has no obvious successor. Sony released the Z5 Compact last year, but it uses the problematic Snapdragon 810 processor, and the US version has its fingerprint sensor disabled(!). The Z5 Compact’s design is also a bit more stodgy. And the Z5 series is the last of the Z’s – Sony’s recent crop of X-series phones are about as forgettable as they come. I don’t want to get too attached to a dying phone. I guess I’ll appreciate the Z3 Compact for what it was at the time, and hope that one day Apple will release an iPhone 5-sized device with an iPhone 6-sized screen. Last year, when I ditched my managed hosting, I converted my blog to use Jekyll, a static site generator. At the time I was pretty overwhelmed with all the tasks necessary to move my digital life, and didn’t want to throw “configure PHP/MySQL” onto the pile. Also, much to my chagrin, when I looked over my Wordpress installation prior to exporting its content, I noticed a bunch of suspicious-looking files that could only have been created by script kiddies exploiting Wordpress vulnerabilities. I thought I had been pretty concientious in keeping my instance up to date, but apparently not. So a static site it was. One of the downsides to a static site is that… it’s static. No comments or any other form of interactivity. At first I tried hooking up Disqus, which I had actually also used in my Wordpress blog, rather than the native comments. Problem is, I dislike Disqus. As with any free service, if you aren’t paying, then you are the product. Managing a Disqus account is annoying, and it’s yet another 3rd party service that gets to track you around the web. So, during a bit of downtime, I created my own basic blog comments app. It’s a Ruby app written with Sinatra that has two routes: GET and POST. Comments are stored in a SQLite database (I’m not anticipating heavy traffic). Include the client-side script wherever you want your comments to appear in a post. It uses reCAPTCHA for abuse prevention. I learned a few things doing this project, including how to use nginx as a reverse proxy (only used Apache before), create an Upstart init script (sigh), and deploy a basic Ruby app on a VPS. It’s amazing how much of this stuff you don’t have to do when working at a company with sysadmin folks XD. It should be fairly easy for anyone to take this code, made a few minor modifications, and run it for their own blog. I would also be happy to answer any questions about getting it up and running… just leave me a comment! 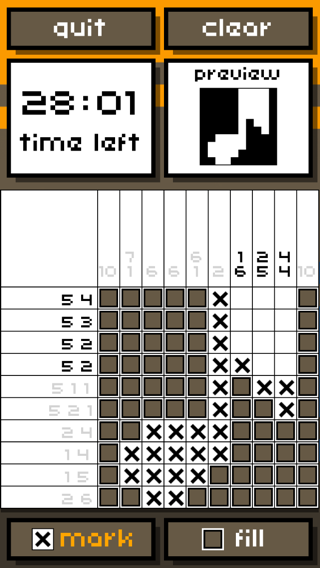 Get addicted to a new type of puzzle — nonograms — in Nonogram Madness! 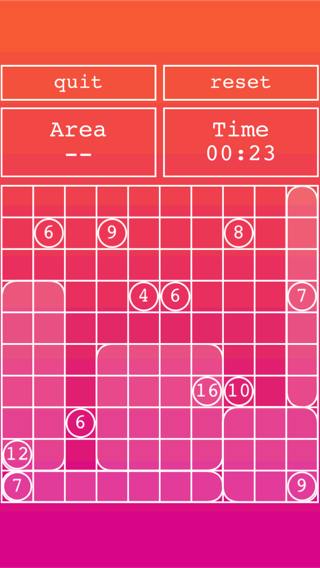 Another Japanese puzzle game — cover the puzzle grid with rectangles, using the provided clues as guidance! Connect all the islands together, using the number of bridges shown on each one. It's harder than it looks! If you're in the market for imported or pre-owned (or pre-owned imported) games, check out Play Asia. I've gotten a lot of good junk from 'em. If you buy something using the link above, I get whole pennies of referral credit!